Bailey Galvin-Scott has taken his last semester in Boston as an opportunity to camp instead of sublet off campus. While most off-campus students wake up to the ringing of alarms in their apartments, Bailey Galvin-Scott rises to the chirping of birds in the woods. 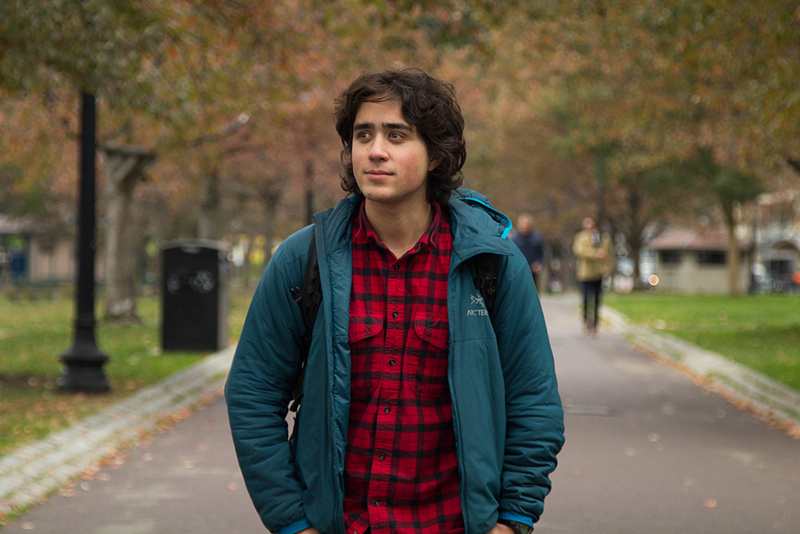 After packing his tent and sleeping bag into his backpack, he hops on the T and rushes to campus for his 10 a.m. class. The senior visual and media arts major is living a nomadic lifestyle this semester—he hasn’t had a permanent home since early September. Each night, he searches for a discreet place to set up camp at parks such as the Middlesex Fells Reservation seven miles north of campus. Although Galvin-Scott never knows exactly where he will be sleeping, the prospect of new adventures intrigues him. Coming from a very “outdoorsy” family, Galvin-Scott first thought about living outside last semester, when rising seniors were deciding where they would live for the next school year. Though several of his friends suggested sharing an apartment, he turned them all down. In an attempt to ease into his new lifestyle, Galvin-Scott began camping about once a week in his junior year despite having on-campus housing. But it wasn’t until this summer, when he and his father took a trip to Nova Scotia and camped off of their motorcycles, that he truly experienced the nomadic way of living. Knowing his love for the outdoors, Galvin-Scott’s parents were not completely shocked by his lifestyle choice. His mother was harder to convince, but eventually came around. Galvin-Scott said the transition between dorm life and camp life wasn’t particularly difficult, and that his biggest challenge is staying hidden and out of sight. According to the Boston Parks and Recreation Department, parks are closed between 11:30 p.m. and 6:30 a.m., seven days a week. The 2017 camping season in Massachusetts State Parks is from May 25 to Oct. 8. Though he generally lives on his own, Galvin-Scott said he still has a social life and people often make efforts to assist him in any way they can. His friend, senior Michael Bartz, offered his couch to the camper. With the coming winter, Assistant Director of Off Campus Student Services Jeff Morris said he hopes Galvin-Scott is aware of the resources Emerson offers, such as hand warmers and blankets for students to take out free of charge. Galvin-Scott is going to Emerson Los Angeles next semester and will be driving across the country and camping off his motorcycle to get there. Though he will be returning to dorm life, he said this experience has been a memorable one that not only taught him about his ability to handle the unpredictability of life, but also the importance of following his heart. “Most people thought I was crazy and didn’t think I would go through with it, but I did,” Galvin-Scott said. “This doesn’t just go for living out of a backpack, but if you have a crazy idea and people don’t think you’re serious about it, just remember that you can be and that no idea is ever too ridiculous."